Source: Drum Runner Material Handling Co.
Model 4500 Drum Handler lifts, palletizes and transports steel, plastic and fiber drums. Its sturdy, all-welded carbon steel design incorporates a series of optimized features. The clamping mechanism has a 4 in.-wide jaw surface rugged enough to secure load up to 1500 lbs. Current model choices include Model 4500A for drums up to 23 1/2 in. 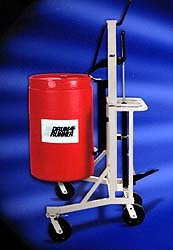 in diameter and Model 4500 for drums up to 30 in. diameter. Drum Runner Material Handling Co., 2010 Zettler Rd., Columbus, OH 43232. Tel: ; Fax: 614-238-0389.